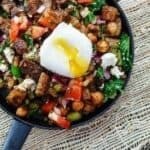 Mediterranean breakfast potato hash with Asparagus, chickpeas and poached eggs on top. A flavorful and nutrition-packed meal to kick-start your day. Add the chickpeas, asparagus, a dash more salt and pepper and the spices. Stir to combine. Cook for another 5-7 minutes. Turn the heat to low to keep the potato hash warm; stir regularly. Meanwhile, bring a medium pot of water to a steady simmer and add 1 tsp vinegar. Break the eggs into a bowl. Stir the simmering water gently and carefully slide the eggs in. The egg whites should warp around the yoke. Cook for 3 minutes exactly, then remove the eggs from the simmering water and onto kitchen towel to drain briefly. Season with salt and pepper. Remove the potato hash from the heat and add the chopped red onions, tomatoes, feta and parsley. Top with the poached eggs. Enjoy! Recommended for this recipe: Private Reserve Greek extra virgin olive oil. SAVE! Try our Greek olive oil bundle! Recommended for this recipe from our all-natural spice collection: Allspice, Za’atar, Sweet Paprika, and Coriander. SAVE! Try our Ultimate Mediterranean Spice Bundle or Create your own 6-pack from our all-natural or organic spice collections!